Economic downturn? Pah! Britain's artisan cheesemakers have stuck two fingers up at the doom and gloom by coming up with a bumper selection of new cheeses in 2011. These are my picks from the past 12 months, but don't expect them to be consistently perfect yet. It can take years for cheesemakers to get a new cheese just right, but these producers have made an impressive start and their cheeses are all well worth trying. Definitely ones to watch in 2012. When she isn’t tweeting (which is a lot of the time) Sarah Hampton spends her time showering her herd of pedigree Saanen goats with love. 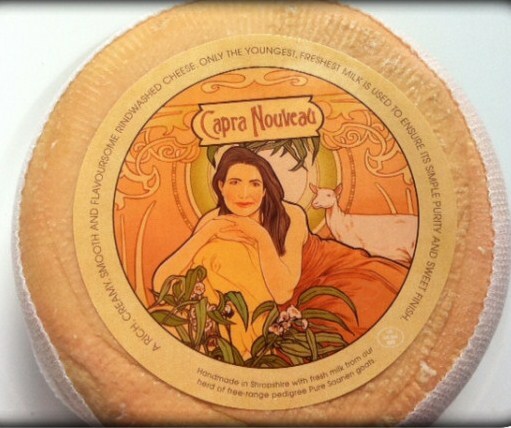 Their pure white milk goes to make the highly acclaimed Capra Nouveau - a new washed rind Vacherin-style cheese, which is sweet and creamy and if left to mature almost collapses with ooziness. Hampton (that's her on the label by the way) has also launched a washed Gouda-style cheese called Dutch Mistress, which is earning rave reviews from chefs. 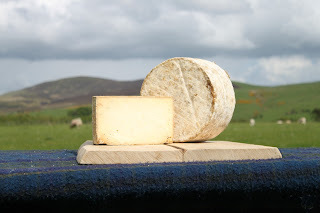 A washed rind cheese with a complex meaty flavour, Brother David is made by Martin Gott on the Holker Estate in Grange-Over-Sands using unpasteurised milk from Shorthorn Cows. Washed in water everyday as it matures over five weeks, the cheese has a fabulous sticky rind with a smoky ham flavour and long milky notes. “It's somewhere between a Langres and a Munster, but has its own distinct characteristics,” says Gott, whose other cheese is a washed ewes’ milk called St James. Made by HJ Errington of Lanark Blue and Dunsyre Blue fame, this Manchego-style ewes’ milk cheese is matured in cloth for six to 10 months and has a pretty mouldy rind. Sweet and earthy, Corra Linn is named after a waterfall in the Falls of Clyde. Selina Cairns, who has taken over production from her father Humphrey, also has some other new cheeses in the pipeline including one called Biggar Blue. Michael and Mary Davenport have been making cheeses since 2005, using milk from their herd of Red Poll and Friesian cows. Their newest cheese has been developed by their son Joe, who has recently joined the business. It's a semi-hard unpasteurised cheese, wrapped in a semi-permeable red coating and matured for three months. There's nothing particularly spectacular about the cheese, but it's creamy and mellow, and the texture makes it perfect for melting. A washed rind version called Cote Hill Reserve is also in development. This Gruyere-style cheese was voted best newcomer at the 2011 British Cheese Awards and is made with unpasteurised cows’ milk near Malpas. Like Gruyere, it comes in great big wheels and, according to the BCA judges, has buttery, grassy notes with hints of white wine and red onions. Anne Connolly, who makes the cheese, previously worked as a chef in the Italian Alps. Patrick, many thanks for the mention! It means a lot to me and to my beloved goats! Yes, I must resolve to be less garrulous in 2012! Season's Bleatings to you and keep up the great work!